Trevose Head Lighthouse is a lighthouse on Trevose Head on the north Cornish coast at grid reference SW850766 lying to the WSW of Padstow  and was sited here as there was previously no light from Land's End to Lundy and it would be visible from Cape Cornwall to Hartland Point. The tower is 27 metres (89 ft) tall, and has a range of 20 nautical miles (37 km; 23 mi), but, on a clear night, you can just spot the light from Pendeen Lighthouse, over 35 miles (56 km) away. The site was surveyed by order of the Trinity Board in July 1844 with a design submitted that November and approved February 1845. Building began in that May with the laying out of the road and contract entered into with the builders the next month. During gales on 20-21 November 1846 scaffolding attached to the tower was blown away. After completion of the first tower, it was determined that the light was under certain circumstances liable to be mistaken by mariners. 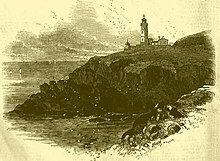 A second lower light was therefore proposed and (the decision having been taken in June 1847) it was constructed, 50 feet in front of the first light, with a covered passage between them for use by the lighthouse keepers. Only the first built 'high' light now remains. Designed by engineer James Walker the two original lights, 'high' and 'low', were constructed under the supervision of Henry Norris  by builders Jacob & Thomas Olver of Falmouth. They were provided with a pair of first-order fixed optics by Henry Lépaute of Paris  and each had an oil lamp with 4 concentric wicks manufactured by Messrs. Wilkins & Co. of Long Acre. The light was first lit on 1 December 1847. In 1882, under Engineer-in-Chief James Douglass, the 'high' light was changed to an occulting light, now with a six-wick lamp, and the 'low' light was put out of use. The lighthouse in 1962 (showing the 36-ft long fog horn installed in 1913). From 1911 a series of further improvements were made. First, the keepers' dwellings were upgraded. Then, in 1912 the light was again updated and the current rotating optic (weighing 3.6 tons) was installed. At the same time work began on installing a fog signal: a 5-inch siren attached to a 36-foot long acoustic horn, which came into service in 1913; it was nicknamed 'Lord Rayleigh's trumpet' after its designer, the eminent physicist and acoustician. The trumpet and siren were built on to the roof of a new engine house, containing a pair of Hornsby oil engines, the air compressor, reservoirs and other equipment. In 1920 a paraffin vapour burner replaced the oil lamp; it was given a red filter to produce one red flash every 5 seconds. The fog signal equipment all remained in service until 1963, when the trumpet and siren were replaced by a set of eight 'supertyfon' air horns mounted in a metal turret on top of the engine house. New diesel engines and Reavell compressors were provided. The light was electrified in 1974. In 1995 the lighthouse was automated and became unmanned. The red colour was removed from the light at this time and the rotation speed of the optic was slowed. By this stage the engine house was suffering cracking due to erosion; with automation a new fog signal was installed (a stack of electric emitters placed at the foot of the lighthouse) whereupon the old engine house was demolished. Former keepers' cottages alongside the lighthouse. The fog signal was decommissioned in 2012. The former keepers' cottages (arranged in two semi-detached pairs) are nowadays available to rent as holiday accommodation. ^ "New Lighthouse on Trevose Head". The Sailors' Magazine. December 1847. p. 284. Retrieved 20 November 2008. ^ a b c d e "The Illustrated London News". 16 October 1847. ^ a b c d e f g "Lighthouse management : the report of the Royal Commissioners on Lights, Buoys, and Beacons, 1861, examined and refuted Vol. 2". pp. 92, 93. ^ "Royal Cornwall Gazette". 13 June 1845. p. 3. FALMOUTH EXPRESS...Messrs. Olver, builders, of this town, have taken a contract to build the intended Lighthouse on Trevose Head, near Padstow, which is to be completed in about 11 months. ^ "Woolmer's Exeter and Plymouth Gazette". 11 December 1847. p. 8. The new light-house so long talked of on Trevose Head has at length been completed...The light was first exhibited on 1st instant. ^ a b c d "Trevose Head Lighthouse". Trinity House. Retrieved 4 April 2019. ^ Woodman, Richard; Wilson, Jane (2002). The Lighthouses of Trinity House. Bradford-on-Avon, Wilts. : Thomas Reed. pp. 96–97. ^ a b c Renton, Alan (2001). Lost Sounds: The Story of Coast Fog Signals. Caithness, Scotland: Whittles. ^ "Trinity House - Trevose Head". Archived from the original on 29 May 2011. Retrieved 4 November 2013. ^ "Trevose Head and Tater Du fog horns switched off". BBC News. Retrieved 4 April 2019. ^ "Trevose Head Lighthouse". cornwall guide. Retrieved 4 April 2019. 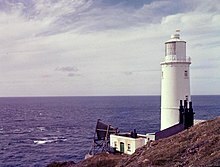 Wikimedia Commons has media related to Trevose Head Lighthouse. This page was last edited on 4 April 2019, at 22:38 (UTC).